Move for Hunger is a 501(c)3 non-profit organization that works with relocation companies to collect non-perishable food items, and deliver it to food banks all across North America. The SVA-DSI team at the hackathon chose to work with UI/UX design to bring awareness to the organizations booking resources, in turn contributing to the social good of the organization, i.e, by donating food while moving. Young people primarily move with the help of friends and family. However, not many do it in a socially responsible way. How can Move for Hunger help 18-34 years move along with creating awareness while moving, by collecting non-perishable food items? 1. The current Find a Mover page doesn't show the closest Mover partners distance accurately. 2. Once you look for the "Get a quote" option, if you want to check other quotes you will have to go back and re-type your postal address or zip code. Due to these pain points, a user does not feel entice to book with Move for Hunger, even if they want to move responsibly. 1. 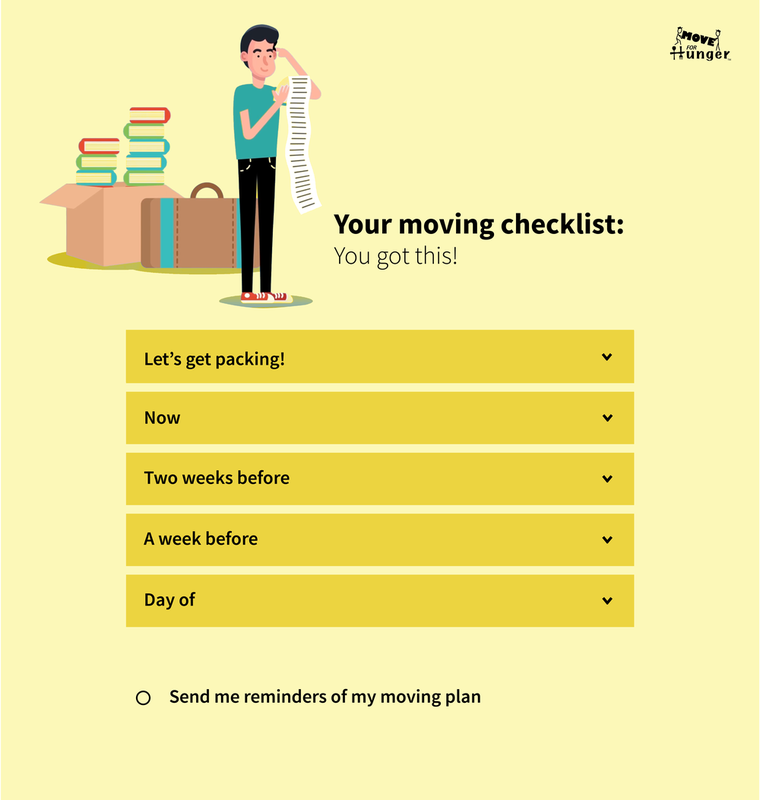 A simple moving check list that aligns with the need of the target audience of 18-34 year olds and offering moving services according to the checklist through the Move for Hunger Website. Also, this helps by making the user experience of filling the details fun and simple. Besides creating the moving checklist tool on the website, we thought that in order for 18-24 year olds to even engage with the website needed to know about the organization Move For Hunger. Through secondary research we wanted to create more publicity by providing ads on Facebook, especially when users decide to move and search for movers around them. By creating Facebook ads, using Facebook plugins and improving the visibility for Move for Hunger, we believe that more and more young people, beyond the current demographic will choose to move with them by engaging with simple user interface like the Moving checklist tool and also doing good while moving, as inclined to the values of Millennials today. Other social media platforms like Twitter and Instagram also creates awareness and calls for enagagement. Challenge: The current Find a Move Tool doesn't filter through movers that move locally in-state, or out of state. Solution/ Recommendation: Using SalesForce CRM and data about movers, we can forward users' information to relevant movers. Challenge: Move for Hunger may not have the capacity to host the web application designed. If millennials choose Bungo Box because of environmental reasons, we believe they are more socially conscious and would be more likely to be compelled to donate unused food items. To reach a wider audience, Move for Hunger might leverage a corporate sponsor. This is also a source of revenue for the non-profit to allow it to scale and further its mission.